The inhibition of angiogenesis is an effective mechanism of slowing down tumor growth and malignancies. The process of induction or pro-angiogenesis is highly desirable for the treatment of cardiovascular diseases, wound healing disorders, and more. Efforts to understand the molecular basis, both for inhibition and induction, have yielded fascinating results. 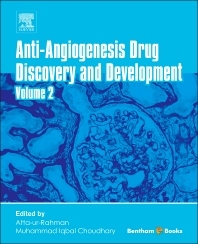 Originally published by Bentham and now distributed by Elsevier, Anti-Angiogenesis Drug Discovery and Development, Volume 2 is an compilation of well-written reviews on various aspects of the anti-angiogenesis process. These reviews have been contributed by leading practitioners in drug discovery science and highlight the major developments in this exciting field in the last two decades. These reader-friendly chapters cover topics of great scientific importance, many of which are considered significant medical breakthroughs, making this book excellent reading both for the novice as well as for expert medicinal chemists and clinicians. Chapter 3: Clear Cell Renal Cell Carcinoma as a Model of Pathological Angiogenesis: Which Actors to Target for Treatment? Chapter 7: STAT3 Signaling in Cancer: Small Molecule Intervention as Therapy? Muhammad Choudhary, PhD, is a Professor of the International Center for Chemical and Biological Sciences, (H. E. J. Research Institute of Chemistry and Dr. Panjwani Center for Molecular Medicine and Drug Research), University of Karachi, Pakistan. He is a member of the Royal Society of Chemistry, London; American Chemical Society; International Union of Pure and Applied Chemistry (IUPAC); American Society of Pharmacology; New York Academy of Sciences; Federation of Asian Chemical Societies (FACS); and he serves on the executive board of the Asian Network of Research on Anti Diabetic Plants (ANRAP). He is a recipient of the National Book Foundation's Prize for Chemistry and the Economic Cooperation Organization (ECO) Award in Education, 2006, given by the President of Azerbaijan. He has published 24 books, more than 570 papers, and 20 patents.